Great price on a new Callaway XR hybrid. Deal shows both the 19' and 22' loft clubs. I'm using the XR2 3 hybrid with a stiff flex, plays fantastic and you can clear over 200 yards with it effortlessly. Never used a hybrid and would look to replace my 15 y/o Mizuno 2 iron. Would this be a good replacement and do they tend to hit the ball high (I'm high ball hitter, even with long irons)? Thanks if anyone can help. Never used a hybrid and would look to replace my 15 y/o Mizuno 2 iron. …Never used a hybrid and would look to replace my 15 y/o Mizuno 2 iron. Would this be a good replacement and do they tend to hit the ball high (I'm high ball hitter, even with long irons)? Thanks if anyone can help. A hybrid for me plays like a long iron so I would say yes it would be a good replacement. Mine is 19° and sits alongside my 3 Wood, I use it for difficult lies or when the wind is picking up. You'll find a hybrid is better for piercing through the wind and not affecting the ball much. My advice would be if you have a local driving range to see whether they have one for you to try. My local (Moreton, Wirral) have a selection of club types to test so you could try a hybrid and see if you get along with it. I tested a load out at American Golf before buying and found that the XR fitted the bill price and feel-wise. It's worth booking a session in their simulator if there is one near you. I tested a load out at American Golf before buying and found that the XR …I tested a load out at American Golf before buying and found that the XR fitted the bill price and feel-wise. It's worth booking a session in their simulator if there is one near you. Thanks guys. Sadly despite having great courses around me, there's no decent golf shops or driving ranges. I tend to work with most clubs and still rocking my 20 y/o Ben Hogan blades lol. Last club I bought was a Ping G5 3 years ago . 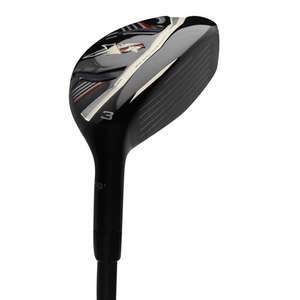 Don't think it matters but off 6 currently and only have a driver and 7-wood so really considering getting one of these and see how it goes as a sort of 3/4 wood. 2016 model but good price. Must other stores have these all sold off. But 90 a great price for any Cally fan boy. Deal posting newbie! This is shipyard first deal post. Help out by leaving a posting tip or just to show your appreciation for their contribution.